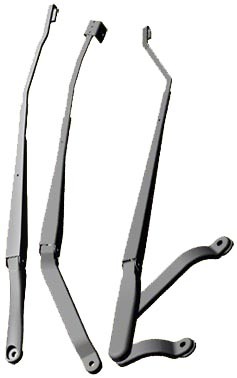 Stainless steel twin vertebra for improved wiping quality, easily adjusts to windshield contours. 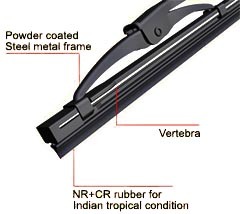 Powder coated steel metal frame for strength and durability and high corrosion resistance. Ozone resistant NR+CR rubber for all weather application. Wide range of sizes to suit vehicles around the world. 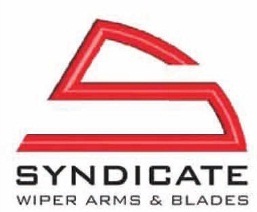 SYNDICATE® manufacturers more than 3 Million wiper arms every year and also offers our customers aesthetic look on design as well as noiseless, smooth and effective performance. 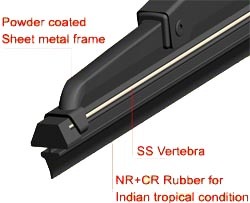 Wiper arms are designed to meet functional requirements and styling preferences of vehicle manufacturers and are manufactured with a variety of wiper arm heads to meet cost and weight targets of our customers. Coated with weather and UV resistant Powder paint to obtain corrosion free long life. Most economical and effective cleaner for windscreen. Highly concentrated washer fluid for clear vision Concentrated cleaning agent for windscreen washer reservoir removes oil, silicone film, insects marks, exhaust smoke residues, traffic smear which could damage the wiper blade. It ensures anti-dazzle clear view also eliminates noisy and chattering sound. Clean windshield glass with Syndicate Windscreen washer fluid to eliminate silicon oil like film, twice a week in rainy season. Really beneficial for the customers to improve the wiping performance.